Can’t wait to get your hands on the latest Google Nexus phone, the LG Nexus 4? If you’re in the UK, then you’re in luck — the LG Nexus 4 is now available for pre-order in your area. UK retailer Carphone Warehouse has prematurely opened up its Nexus 4 pre-order page, laying bare all the details of the next Nexus smartphone from Google and LG. In addition to confirming already-leaked details, the CPW listing reveals the presence of ‘Android 4.2 Jelly Bean’ and Corning Gorilla Glass 2. As for what’s new in 4.2, the retailer claims an ‘amazing 360-degree camera’ and Swype-like ‘gesture typing’ in the stock keyboard. For people hoping to get bigger storage space, unfortunately the memory listed with the ad notes that the LG Nexus 4 will only have 8 GB. No word yet if we’ll be getting higher storage variants. As for pricing, the device will be available for free with a new Vodafone or O2 contract, starting at £31 per month and £389.95 ($630) without a contract. What’s interesting though is that it promises Android 4.2 with the device. If this proves to be true, then it looks like Android fans will be in for an early update to Android 4.1 Jelly Bean. While we’ve speculated that the likelihood of a new version of Android will be launched with the LG Nexus 4 was slim, it looks like Google intends to stick to tradition and reveal their lates flagship smartphone with a brand spanking new version of their Android OS. 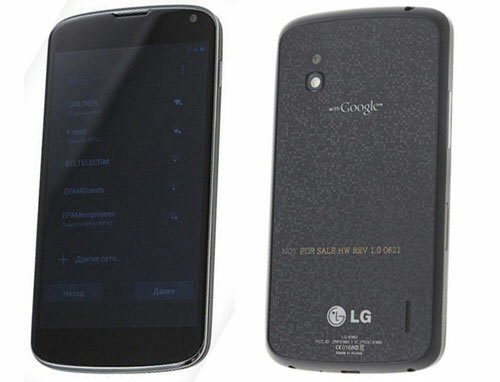 Will you be getting the LG Nexus 4? Do you think it’s priced right for the features that it comes with? Share your thoughts in the comments below!